iPad version now available on the App Store. Two former developers at Bizarre Creations, the studio behind classic racing franchise Project Gotham Racing, have re-released the Dreamcast title Fur Fighters for the iPad. Speaking to Eurogamer, Muffin Games' lead programmer Mark Craig (who worked on the original version of the game), explained how the challenge of porting the console title to mobile hardware came about. "I had seen the specs of the iOS devices getting close to the Dreamcast," he told Eurogamer. 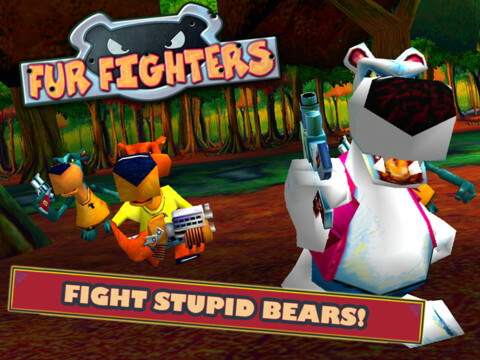 "You had the iPad 2 coming out and other devices, and I thought, well maybe I should try porting Fur Fighters just to see if a Dreamcast spec game will work on an iOS device. That was my main motivation, a curiosity thing. "Plus I wanted the game to come back in some form. I thought, if I could get the ball rolling and just see if it was feasible...that's how it started." Jeff Lewis, lead designer at Muffin Games explained how he came to acquire the rights to the franchise, following the closure of Bizarre Creations. "Bizarre Creations was cleaning house and tidying up its business dealings," he explained. "By that point it was pretty clear there wasn't going to be a sequel to Fur Fighters. The MD, Martyn Chudley, knew it was going to go into the ether if anything didn't happen with it. As I had done the character design and came up with a lot of the world, he very generously, just as a gesture, gave me the right. He couldn't give it to me. He had to sell it to me for a pound. I gave him a fiver because I was very pleased." "He really just meant it as a nice thing, rather than seeing it disappear forever. I don't think either one of us had any expectation things would change in the way they have since 2007, and an opportunity to port the game to a mass market device would come along again." The game is available to download from the App Store now.